The other day I had to go to Maidstone. I really can’t think of any other word to describe the place rather than dull. It has the usual chain shops if you want to buy some things, and a pretty town hall and museum, (and a prison with huge stone walls slap bang in the centre) but that’s about it. It’s the sort of place you go to run errands, no other reason. It’s not horrible, but not particularly interesting either.When I was at school I sometimes went to gigs at the student bar there, but it was such a pain to get back in the evenings I didn’t bother too often unless I knew someone who was driving. When I was really little I used to go to see the Sooty Show and pantomimes at the theatre, and that was the high point of Maidstone in my estimations. I bought some boring black tights and socks that I desperately needed, and had a poke around the charity shops and a nice second hand shop called Trash and Treasure. There was another second hand clothes shop that seemed to be 80% (real) fur coats. As a long-term vegetarian I found going in there really creepy, especially as it’s the only vintage clothes shop I’ve encountered that doesn’t play any music, and the owner barely speaks. Just silence and dead things. I couldn’t get out quick enough. I had good luck with the other shops though, I got some nice things for very little money. Some checked culottes. I don’t normally wear culottes or shorts, but maybe it’s the time to try. If it turns out I don’t really like them, well it’s not like I wasted more than £2. The purple stripy t-shirt and blue glitter tights are from the H&M sale rack. 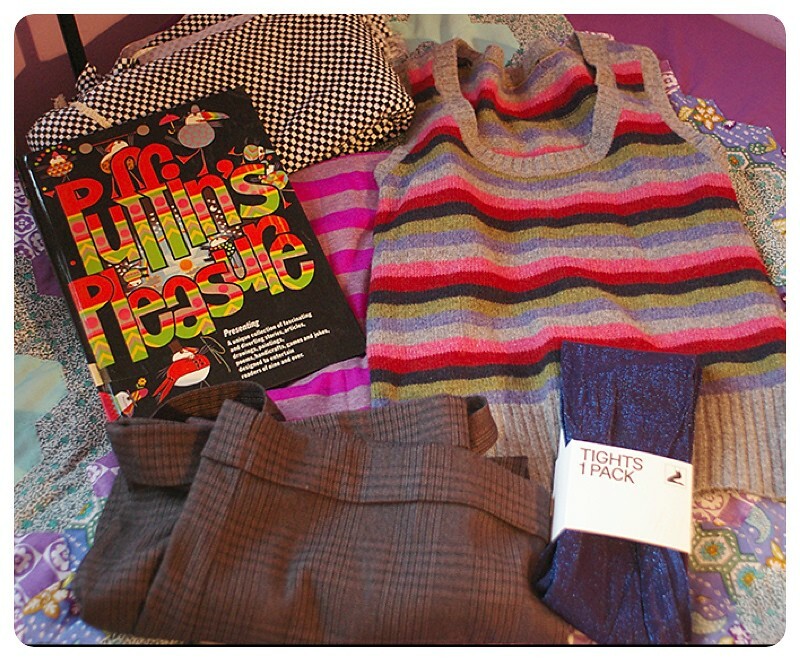 H&M make the best tights, they last forever.The stripy wooly tank top was also second hand, as was the Puffin book, and the checked corduroy fabric. I’m not quite sure if the fabric is thin furnishing fabric, or thick dressmaking fabric. I supposed I could make both a cushion and a dress, and hide on the sofa. That’s the dream. I have a few of these Puffin annuals from the 60s. They have really great illustration inside. While I was there I also went to the local museum, which is in a rickety old Tudor manor house with a very strange layout. I love small town museums that have a bit of everything in them. I used to go to Maidstone Museum quite a lot when I was a kid for their summer activities. They’ve had a refit, so some of the things have moved round. They used to have an unwrapped mummy in the same room as the taxidermied animals, I suppose on the grounds that they were all preserved. The mummy rests in the chapel these days, with a sign with her name from the sarcophagus, which I think is a nice touch. They still have the dinosaur exhibit in the fake cave with the balcony, and the gallery full of stuffed ducks, and the incredibly claustrophobic gallery with Egyptian things on one side, and Victorian toys on the other, but the fake Japanese tea garden with the fake river is sadly gone. I brought my camera with me, but realised I’d forgotten to put any batteries in once I tried to use it, which was a real pity. I discovered some other galleries I didn’t remember, which I really enjoyed. There was one of the history of costume, with lots of beautiful outfits and very good descriptions, and curiosities like a Regency pregnancy corset. There was also a gallery dedicated to the collection of a local Victorian explorer called Julius Brenchley. He travelled all over the world, but seemed to particularly like the Pacific Islands. His diaries were surprisingly open-minded for the times (or at least the extracts the museum chose to print were), he seemed to admire a lot of the cultures that he came into contact with, and the exhibition had all kinds of interesting stories, like the time he fell into an active volcano in Hawaii, and everyone thought he was dead, but the locals managed to fish him out, and invited him to their feast as a guest of honour. Maybe he just came across as more likeable than Augustus Pitt-Rivers, which really isn’t all that difficult.